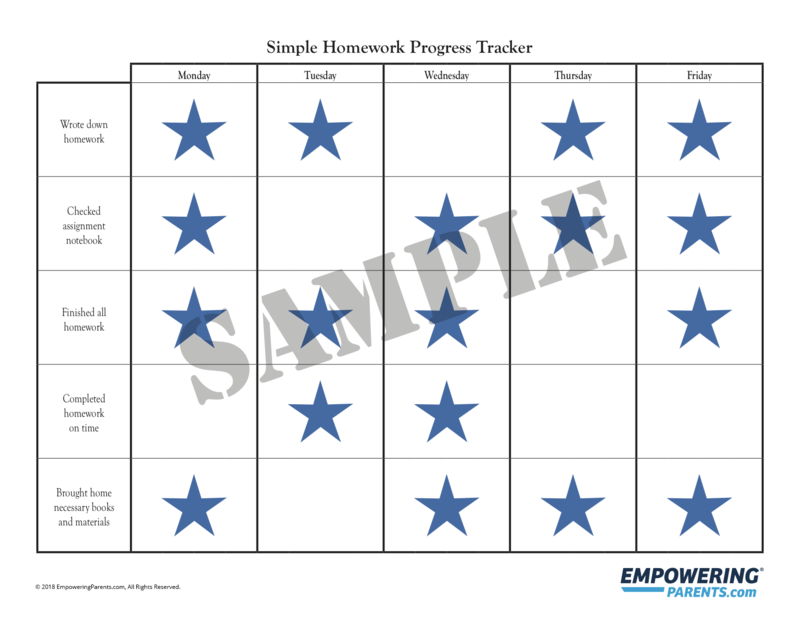 The homework chart allows you and your child to keep track of several homework related activities. It is important that you help your child with this for the first few weeks to ensure that your child understands how to use it. You could also involve your child’s teacher with certain portions of this chart. For example, you could ask your child’s teacher to initial the chart when all homework is complete or when your child writes down their assignments accurately. This might be more appropriate for some children, particularly those who have a history of being dishonest about schoolwork. For the first week you simply sit with your child and go through the worksheet together each day. For each activity the child completes, put a sticker, star, checkmark, or smiley face in the corresponding square. It is important to ignore a bad attitude, whining, etc. Focus only on whether the task is complete. It is not recommended to put any negative words or symbols such as “No” or a frowning face. At the end of the week, count up the number of positive marks your child earned each day or for the entire week. This is the baseline. Now that you know the baseline, you can set a goal for the following week. Daily goal and reward system: The maximum number of positive marks your child can earn each day is 5. Suppose your child currently gets 2 positive marks each day. It is not reasonable to ask your child to immediately begin getting 5 check marks each day. Rather you want to start where she is and slowly work forward. You might make it a goal for your child to get 3 positive marks per day next week. Each day your child reaches 3 positive marks next week, she would earn a reward such as extra TV time. Weekly goal and reward system: You could also offer weekly rewards. Suppose your child only achieved a baseline of 10 positive marks for the week. For the next week you might set a goal for your child to earn 15 positive marks. If she gets 15 or more positive marks next week, this would earn her a larger reward in the weekend such as having a sleepover. Get your free Simple Homework Chart now!